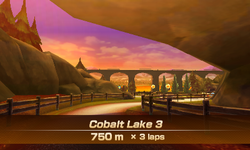 Cobalt Lake 3 is the third and final race course of the Cobalt Lake area and the final Flower Cup course in the horse racing mode of Mario Sports Superstars. As all final race courses, this course takes place in a different time of the day, this time being sunset. The length of this course is 750m, making it the shortest final track of all areas, as well as sharing its length with Cobalt Lake 1. While the track is shorter than the previous Cobalt Lake tracks, it has far more trees and hedges and the introduction of higher jumps on top of raised wooden, narrow platforms to retrieve higher items. The track first starts out on a stone bridge with a road that leads to the left, which has a cluster of stars on the outside portion and a single star on the inside turn, and it then leads into the right underneath an overhang, which turns to the right. Past the overhang, players encounter many hedges and trees, with carrots being positioned on top of the hedges on the inner area of the curve while stars are positioned on the outside portion. 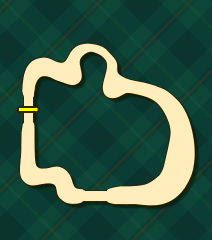 After players go through the straight portion, they curve to the right, with the option of taking two paths. The right path is a path that leads players through raised wooden platforms that players must leap over to traverse to obtain carrots and stars or they fall to the lower portion of the track, while the left path takes players through hedges and more carrots than the right path, but no stars. Past this, players run over a dash panel into a straight area with many hedges and carrots. The last portion of a track has a dash panel and roads that twist through grass, until players see the finish line. Inside the overhang, on one of the first turns of the track. On the area just past the overhang, with many trees and hedges. Two paths, where players can pick the raised path with the wooden platforms or the lowered path with more carrots and hedges to jump over. The straight area with many hedges and carrots. This page was last edited on September 10, 2018, at 22:16.